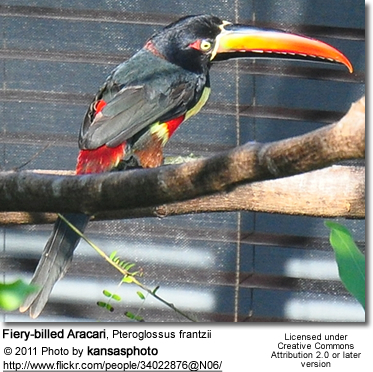 The Fiery-billed Aracaris, Pteroglossus frantzii, are Central American toucans that occur naturally only on the Pacific slopes of southern Costa Rica and western Panama. Small flocks, typically consisting of up to 10 birds, move through the forest with a rapid direct flight. Aracaris generally roost socially throughout the year. Up to five adults and their fledged offspring sleep in the same hole with their long tails folded over their backs. 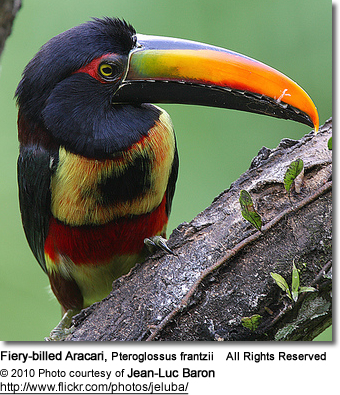 The Fiery-billed Aracari is a brightly marked toucan with a large bill. The adult averages 43 cm or 17 inches in length and weighs about 250 g or 9 oz. Both males and females look alike. 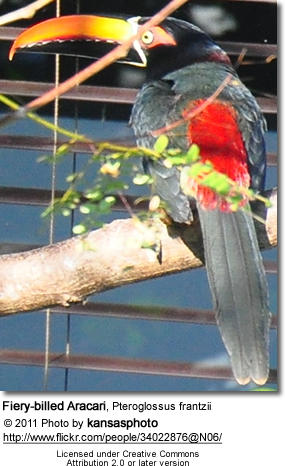 Adults have a black head and chest and dark olive green upperparts, apart from a red rump and upper tail. They have a reddish collar on the hind neck. 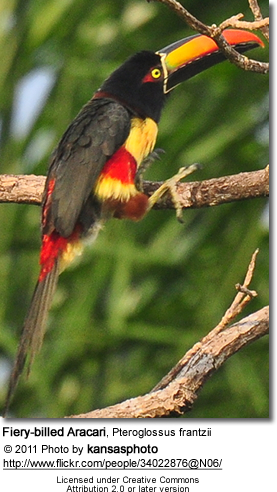 The underparts are bright yellow, with a distinctive round black spot in the center of the breast and a red band across the abdomen. The thighs are chestnut-colored. The bare facial skin is black, turning ruddy behind the yellow eye. 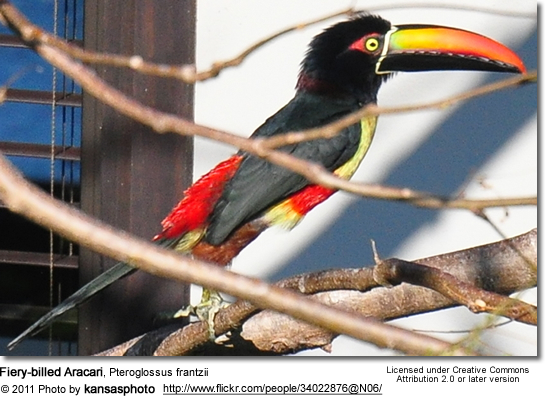 The upper beak is bright orange, the lower beak is black. The legs are green. 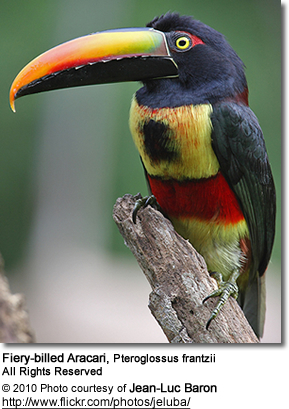 Similar Species: This species is similar to the closely-related Collared Aracari, Pteroglossus torquatus, with which it is sometimes considered conspecific. 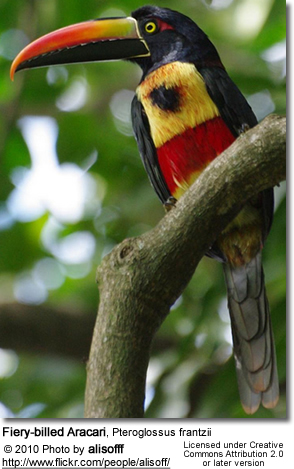 It differs from Collared in the orange upper mandible, red belly band, and larger dark breast spot. 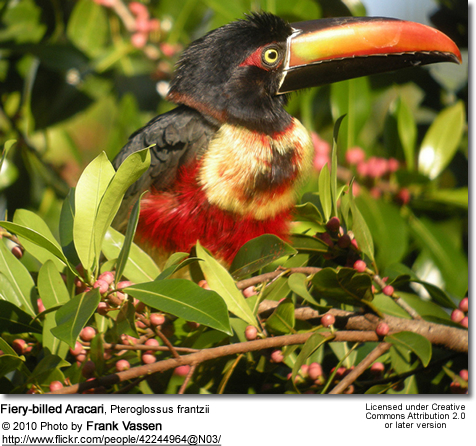 The call of the Fiery-billed Aracari is a loud, sharp pseek, or keeseek, similar to that of Collared Aracari, but more often two-noted. They are common resident breeders in lowland forests and clearings. The female lays on average a couple of white eggs into an old woodpecker nest (or other tree cavity), about 6-30 m high in the canope. The eggs are incubated for about 16 days. The newly hatched chicks are blind and naked with short bills and specialised pads on their heels to protect them from the rough floor of the nest. Both parents, as well as their previous offspring or other adults feed the chicks, which fledge after about 6 weeks. The adults continue to feed them for several weeks after leaving the nest. The active Aracaris require large, planted flights. Aracaris are generally docile and can be kept with smaller birds -- but not birds so small that they (or their young) could be considered as prey by these large birds, such as finches. Breeding pairs are best kept alone. 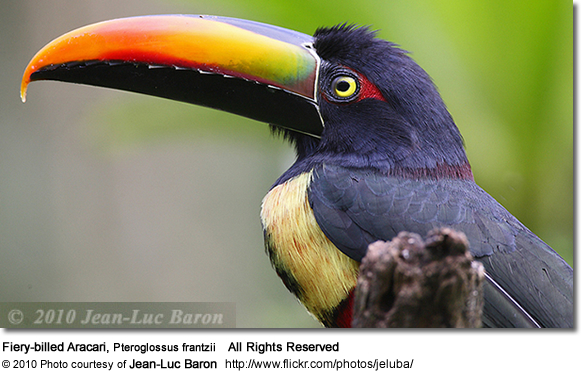 "Toucanets and Aracaris ... all require the same space. The smallest breeding flight I have used was 4' x 10' x 6 feet high and the flights I currently use are 8' x 12' x 8 feet high and the newest flights are 8' x 16' x 8 feet high.